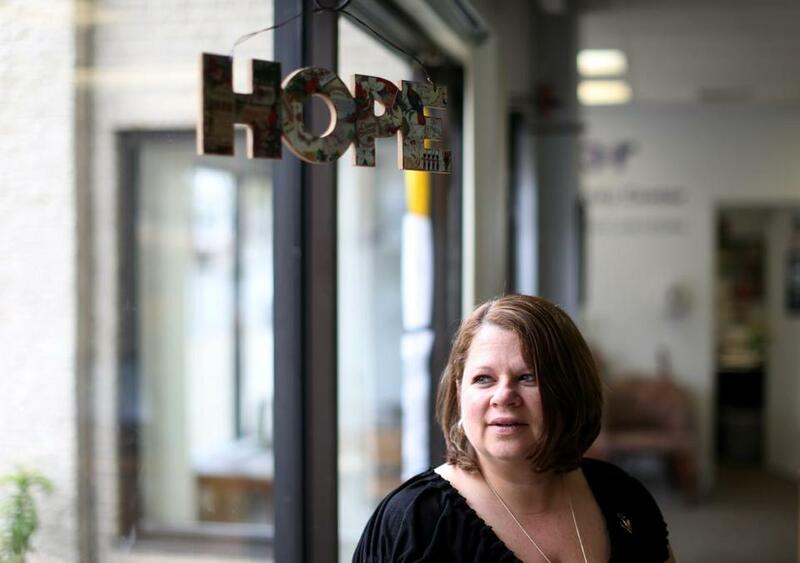 Fentanyl heightens a heroin crisis in R.I.
Holly Cekala sees as many as 700 people looking for help a day as manager of the Anchor Recovery Community Center in Pawtucket. PAWTUCKET, R.I. — A recovering heroin addict, fidgeting on a lonely block of weathered downtown storefronts, recalled his jarring introduction to fentanyl, a man-made opioid linked to half of the 91 overdose deaths in this tiny state since the start of the year. “I knew right away I was in trouble,” said the 40-year-old Providence man, who identified himself only as Seamus. Instead of a “comfortably numb” high from what he thought was unadulterated heroin, Seamus was overwhelmed by a frightening, rapid rush that knocked him unconscious for 12 hours — a rush ignited by fentanyl. At that time, a decade ago, the powerful painkiller barely registered in public awareness. But in the last few months, fentanyl-laced heroin has burst from obscurity and contributed to dozens, and possibly hundreds, of opioid deaths in the Northeast. “Right now, this is the biggest threat to the health and safety of Rhode Islanders,” said Dr. Michael Fine, director of the state Department of Health. It is a fast-moving, fast-expanding threat that has startled police and health officials in a state long accustomed to the scourge of addiction. “We were losing 120 to 160 Rhode Islanders a year before this stuff,” Fine said. But now the numbers have reached staggering proportions. In addition to the 91 overdose deaths since Jan. 1, more than 500 overdoses have been reversed by emergency workers using the drug Narcan. During the same time, the rate of drug-dependent newborns reached a record high. At the center of the crisis is fentanyl, a synthetic opioid used to relieve chronic pain, often after surgery and in end-stage cancer patients. When prescribed, fentanyl can be delivered through injection, a skin patch, lozenges, or even in lollipops. But dealers are blending it with heroin, creating a lethally potent mix. “I don’t think there’s been another crisis that has taken this many Rhode Islanders in this short a time,” said Tom Coderre, chairman of the nonprofit Rhode Island Communities for Addiction Recovery Efforts and chief of staff to state Senate President Teresa Paiva Weed. The deadly heroin-fentanyl mix is compounding health problems in a state ranked No. 1 for illicit drug use in 2012, according to the latest federal estimates. The data, compiled from face-to-face interviews, reported that 15.6 percent of Rhode Island residents had used illicit drugs within the previous month, compared with the national average of 8.9 percent. Rhode Island also ranked high in the abuse of painkillers — first in New England that year, and ninth in the country — according to the data from the Substance Abuse and Mental Health Services Administration. The over-prescribing of pain medicine, and its subsequent diversion to other users, is routinely cited by health officials as a path to addiction and street drugs, including heroin. Law enforcement agencies — from local police departments to the federal government — are searching for an effective response, too. About 200 police officers from all six New England states met in Boston last week with the Drug Enforcement Administration to share information about heroin and fentanyl. The forces that pushed fentanyl to the forefront remain unclear, Fine and law enforcement officials said. Some users crave the extra potency, several addicts told the Globe. But many others are unaware that the heroin they buy has been mixed with a powder form of fentanyl, the addicts said. Warwick police Captain Joseph Coffey, a member of the state’s Drug Overdose Prevention and Rescue Coalition, said authorities believe that most of the fentanyl, often made clandestinely, is brought into Rhode Island separately, before dealers blend it with heroin. In suburban Warwick, that mixture is believed to have contributed to many of the 13 apparent overdose deaths since Jan. 1, including one that occurred in a parking lot during a coffee break. Coffey spoke one recent day near a drop-off box for unused prescription drugs that had been placed in the police station lobby. Hours earlier, the box — crammed to the brim — had been emptied of 40 pounds of painkillers and other prescription drugs. Since the bin was installed in February, Coffey said, Warwick officers have pulled out 100 pounds of drugs, including fentanyl and syringes. A broad network from the grass roots to government has come together in Rhode Island to confront the crisis. Training in the use of Narcan has even been offered at the State House for legislators and the public. “I haven’t seen this kind of involvement before,” said Anchor Recovery’s Cekala, who lost a niece and a nephew to overdose deaths and whose mother struggled with heroin. The state, buffeted last spring by a cluster of overdose deaths, responded quickly when a new surge hit in early January. Within days, all doctors in the state had been alerted. In March, Fine issued an emergency regulation that made Narcan available to all doctors and emergency-room physicians in the state. In another emergency decree, all health care workers and hospitals in the state were ordered to report suspected overdoses — fatal and nonfatal — within 48 hours. Rhode Island authorities said they are unsure whether the state has been affected by fentanyl more than their neighbors. Boston, by contrast, has confirmed only one fentanyl-linked overdose this year. Statewide, the Massachusetts Department of Public Health does not collect or release real-time data on suspected overdoses. In Rhode Island, State Police plan to carry Narcan in every cruiser. Legislation is pending to require insurers to cover therapy with methadone and Suboxone, drugs that are used to treat those addicted to heroin and other opiates. And “recovery coaches,” nearly all of whom have struggled with addiction and found long-term sobriety, will be available beginning Friday in some emergency rooms to counsel overdose patients. Large pharmacy chains are helping, too. In an agreement with the state Department of Health, Walgreens is offering Narcan to the public under a universal prescription that covers everyone who walks in the door, whether they are from Rhode Island or from out of state. “Shame on us if we don’t work together,” Fine said. That collaboration has included the federal Centers for Disease Control and Prevention, which dispatched a team to Rhode Island at the state’s request to study the who, what, when, and why of the overdose surge. The findings are not expected to be available for another few months. On the street, addicts said awareness is spreading about the dangers of fentanyl-laced heroin. But any fears are pushed aside by the basic, gnawing need to stave off the pain of withdrawal. Inside Anchor Recovery, counselor Todd Bourassa recalled the sight of a comatose acquaintance, lying in an emergency room, shortly after she had overdosed on fentanyl and heroin. Brian MacQuarrie can be reached at macquarrie@globe.com.